My kids just started holiday break and are already bored! We still have two weeks until school/normal life resumes, so I think them complaining that ‘there’s nothing to do’ will drive me mad long before then. Luckily, I’ve been able to create some really fun crafts with them during our off-time, from holiday items to gifts to just plain old crafty messes! One we got to do this week is this adorable Frozen Olaf Treat Jar from Yahoo! DIY. While searching on Yahoo! DIY for quite awhile (longer than I probably should have, since there’s plenty I need to get done) I came across this super fun Frozen Olaf Treat Jar and instantly wanted to make it. She used terra cotta pots and saucers, making it a lot more sturdy….but also a bit more expensive and not very kid-friendly. I decided to just find supplies I had on-hand to make ours! Now, I may or may not have a ridiculous habit of saving every single glass jar we go through…..okay, I really do keep them all! Storing them drives me nuts, but then I love times like this when I can find pretty much any size/shape of jar I need! To make your own Olaf Treat Jar, go through your house to find supplies you already have to make it work. No need to spend more money, especially during the already-tight holidays! Since I used some random hot drink paper cups with lids for mine, I had to paint my lids with the white paint. Do plenty of coats, then allow to dry completely. Hot glue one of the lids to the bottom of the jar. This just makes a nice ‘stand’ for Olaf to be on and adds some white at the base to ’round it out’. Cut out little ‘stick’ arms with the brown felt, then hot glue inside as you glue the remaining 2 lids together. Use the black marker to draw Olaf’s mouth onto the bottom cup. Add a white felt ‘tooth’. Hot glue the two cups together. I started with a smaller tooth, then decided I wanted it bigger and just glued the bigger one over it. Wrap your orange felt around a stick (or just roll the felt, whatever’s easier) and glue securely. Glue it as Olaf’s nose. Add black felt behind the googly eyes (slightly above) and glue those to the face. Draw on his eyebrows with your marker. Glue the black pom-poms onto his ‘belly. Don’t actually glue the 2 top saucers to the glass jar, just set them on top. They’re your ‘lid’ for the treat jar! Glue Olaf’s ‘head’ (the 2 cups glued together’ to the top 2 lids (that are glued together) so they’re one piece. Take 3 different length pipe-cleaner pieces and glue them to the top of his head, then bend them so they’re like ‘stick’ hair. Fill up your jar with treats, and you’re done! 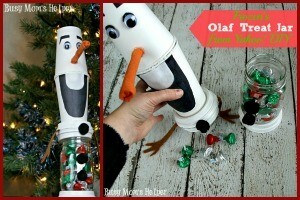 I’m so in love with this craft, and my kiddos were thrilled to make some Olaf jars! Although we’re totally in love with all things Frozen, Olaf is our favorite! 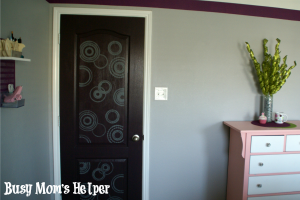 Everyone knows I love stencils, especially when it’s something that will add a stylish ‘pop’ to a room in my home! I’ve done doors, walls, beds and more. This week I got to learn how to Make Your Own Stencils with Silhouette! 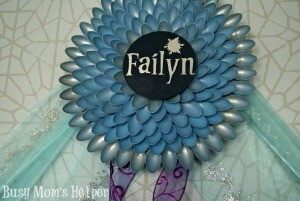 I love using my Silhouette Cameo often, but mostly have used it for vinyl and cutting out shapes or designs. Like, a LOT! But the Silhouette has so many more options, and I was so excited to try something new with it, and was pleasantly surprised! Since we have a bunch of family coming this weekend, I wanted to make the house a bit more…presentable. We’ve lived in our home a year now, yet I only have a handful of decorations up. My kitchen is especially bland…nice and clean…but bland. 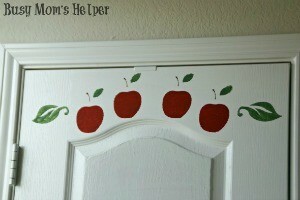 I wanted a cute little pop of color, and decided a crisp red apple design on our pantry door was just the ticket! Of course, I wasn’t about to paint any sort of design free-hand because my drawing skills are…well..non-existent! 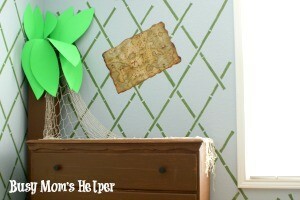 This was the perfect project to try out my new stenciling material. Woot Woot! One of my favorite things about Silhouette is that the program is super easy to use, yet can do so many different things! Their online shape/design store has pretty much anything you could want. I found the perfect apple shape for my pantry, along with a swirly leaf design. I laid it out nicely in the program…. ….then just select the ‘Stencil’ material to get your cutting settings. It’s great at telling you what level to put your blade at, so it’s the perfect depth for whatever material thickness. Load your stencil material into your Silhouette machine, then hit ‘CUT’. 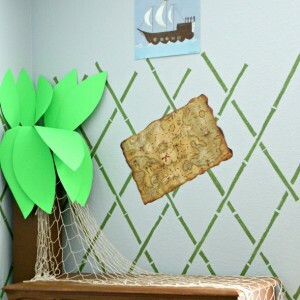 Away it goes cutting out your stencils perfectly! Once it’s cut out, remove the cut-out shapes. It’ll leave you with your perfect-edged stencil! Now, did you know that Silhouette’s stencil material is adhesive? Well, it is! No trying to tape your stencil to your surface and hoping it stays on. 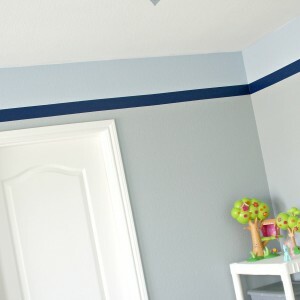 Just peel the stencil off the backing, and apply it firmly and smoothly to your desired area. See? It stays on securely so your hands are more free for the actual painting. Love it! Next comes the fun part…painting! I even did a spot using the inverse of the stencil, for a fun little ‘outline’ instead of a filled in shape. 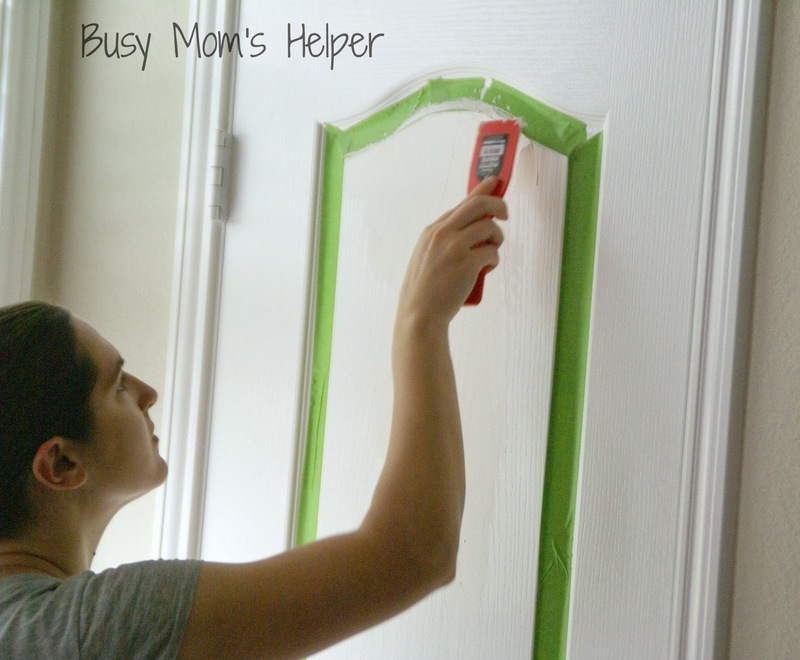 Allow the paint to dry, then carefully peel off the stencil. Guess what? It’s reusable! Just make sure to store it with the backing so it doesn’t get all dirty or bent funny. Look at how it turned out on my pantry door! Seriously, I’m loving how easy this was to use! And the inverse stenciled shapes? So fun and spunky! They did bleed a bit because the wall is very rough and bumpy, so just keep that in mind when choosing your area for a stencil. My kitchen now has some pretty colors, and it only took me less than an hour from design to finish! I can’t wait to do more stencils with Silhouette, perhaps next time a border for one of our rooms, or maybe even some accents for a gallery wall! The possibilities are endless! 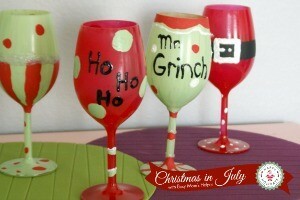 Check out these other fabulous projects using my Silhouette Cameo! 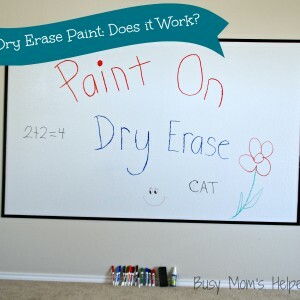 Dry Erase Paint: Does it Work? TWO Projects! 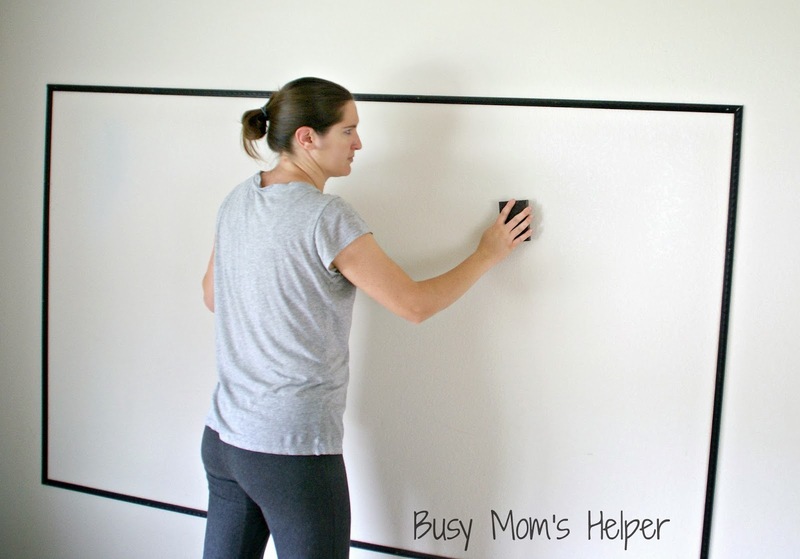 So I’ve been hearing a lot of chit-chat the past few months about Chalkboard paint. Gotta say, I’m really not a fan of chalkboards because of the MESS that comes from all the chalk. So….then I noticed the hype of Dry Erase Paint. Hmm….sounded GREAT, but would it really work, or just be kind of ECK on my wall? You can get the paint for about $21 on Amazon. IMPORTANT: You have to use all of the paint WITHIN 1 HOUR of mixing these, so make sure you’re completely ready!!! For my projects, I planned ahead for both, so I could paint one, then do a coat on the other while waiting on the first. Then back & forth, etc. Just make sure you’re ready before mixing. 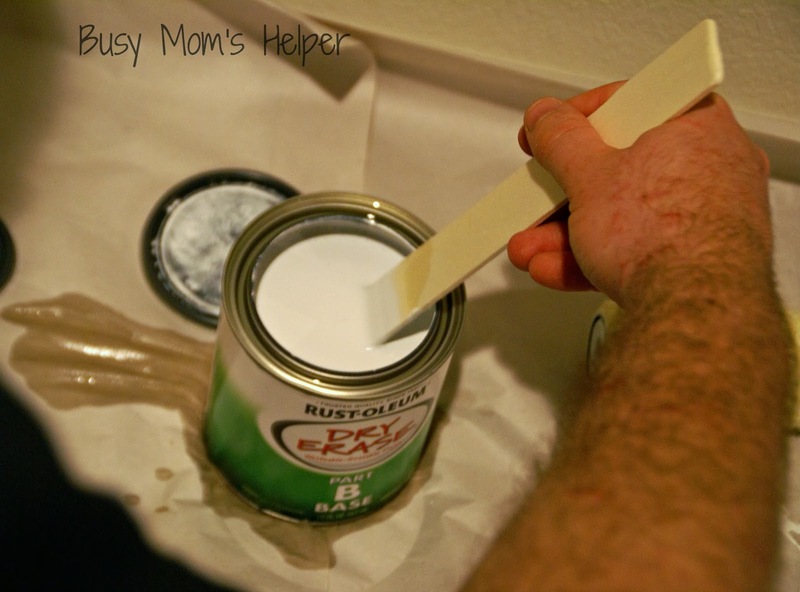 When you are ready, pour the smaller, yellowy liquid into the large can with the white paint. Mix VERY well. Then paint!!! Wait 20-25 minutes between coats. 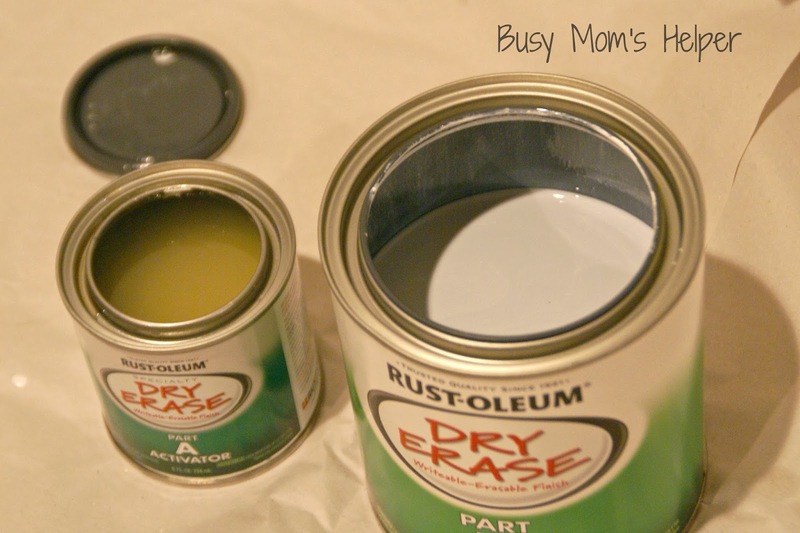 The cans recommend using 2 coats, but I used 3 just to be safe. 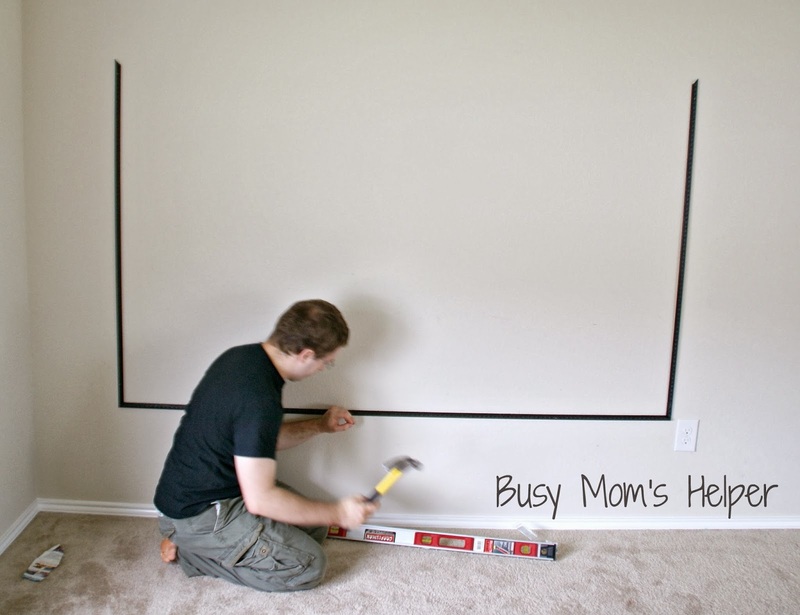 So another blank wall in our house needed something, so I thought “hey, why not a big dry erase board for the kids when they’re playing school, or coloring, or want to dry, or…” Ya, endless possibilities! Step 3: Primer it, just to be sure it’s a smooth color, cover up blemishes from sanding, and help it be as smooth as possible. 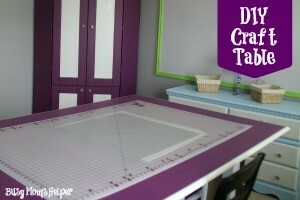 Allow to dry completely before doing Dry Erase paint. Notes: Although we did spend quite a bit of time sanding, I really wish we had made sure it was VERY SMOOTH. When drying it, the little grooves and bumps do make it difficult and it isn’t as good as I would have liked. 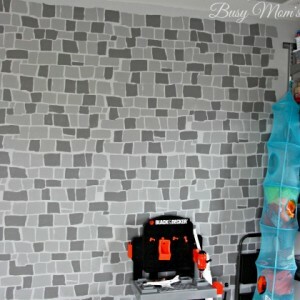 Effectiveness: For this wall, and it could be from the lack of perfect smoothness, I wish I had used 4 coats just so it would erase a bit easier. It works okay, but we do have to use the spray more than I’d like and there is a slight color left. However, again, this could be from the little roughness or from needing one more coat. Also, we could have tried mudding it to make it smoother, like we did the project below. 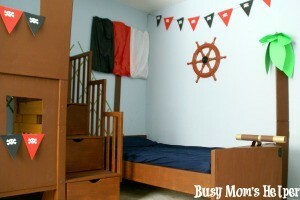 Still love it, though – the kids have used it TONS and still think it’s a blast! I really have been wanting a nice, big, easily view-able Menu Board in my kitchen, so thought it would be fun to have it on my pantry door, right next to my fridge. Step 5: Paint with Dry Erase Paint. Wait 20 minutes. Paint again. Wait 20 minutes. Final coat, allow to dry. And it erased WONDERFULLY!!! It was so much smoother than the wall, so I bet that helped. Still 3 coats like the other, too. I love it!!! 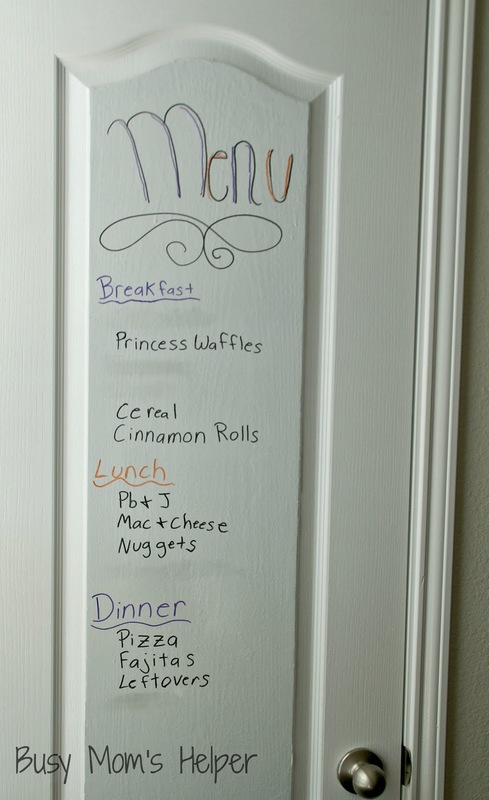 It’s been so nice to just erase as we have meals, and when I’m wondering what I had planned I can glance over and it’s there in big, colorful letters. Cause colorful is more fun, right? 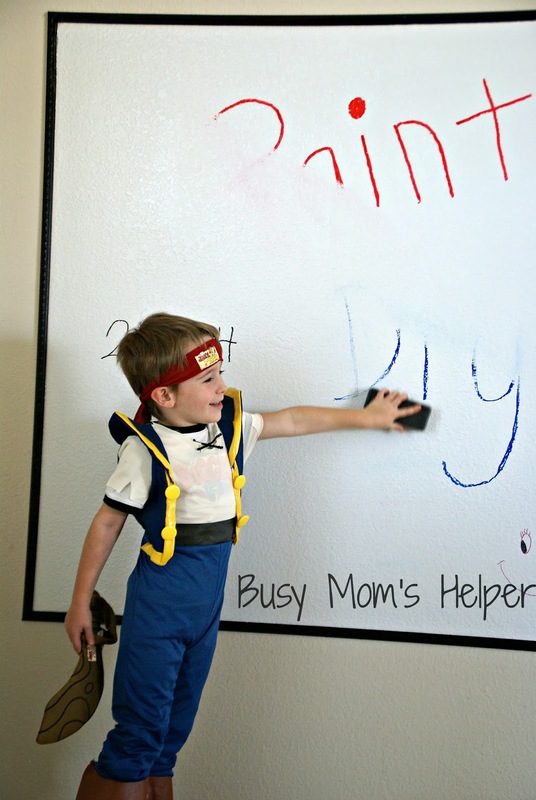 Have any of you tried Dry Erase Paint? I do recommend it – but make the area SMOOTH!! !